In a straight news story (as opposed to the editorial page), the Washington Post reports that Superintendent Jerry Weast might be in big trouble next year when his contract expires. He's expected to have few friends on the board of education. Correspondent Lori Aratani reports on the possible school board makeup after November: Four seats are up, with incumbents Gabe Romero and Charles "Sleepy" Haughey quitting, and Patricia O'Neill and the popular Nancy Navarro running for re-election. O'Neill is running unopposed. Some lawyer is running against Navarro. Board member Valerie Ervin is considered likely to resign from the school board if she is elected to the County Council. Supersized Steve Abrams would resign if he wins his long-shot candidacy as a Republican at-large member of the County Council. The only one sure to stay on the school board for now is the controversial Sharon Cox, who made national headlines last year as promoter of the since-discredited condom-on-a-cucumber video. Aratani comments: "The big question is, what could this mean for Superintendent Jerry D. Weast, whose contract is up for renewal next year? Stay tuned." 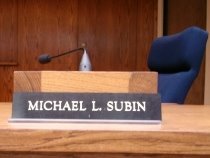 Word from the grapevine is that MCPS might hire soon-to-be-former County Councilman Michael Subin, whom Democratic voters threw out of office in the September 12 primary after he chaired the education committee for a staggering 20 years. PTA members don't quite see what the blustery skinhead can do to improve the kids' education - but MCPS would find him convient to bully the kids' parents! County Councilman Michael Subin, the only incumbent ousted in the September primary election, lost his grip on power when he tried to shut down Seven Locks Elementary School and turn it into a big housing development. In a story about how Montgomery County voters wiped out Superintendent Jerry Weast's main political backers, the Washington Post comments on Subin's unexpected fall. According to the Post, "Nowhere was the two men's bond more apparent than when Weast ran into widespread community opposition this year to his plan to build a new elementary school campus to replace Seven Locks Elementary in Bethesda. "When Thomas Dagley, the county's inspector general, criticized Weast's plan in a report, Subin dismissed Dagley's work as a 'very poor document' and challenged his authority to even conduct such an audit. "After other County Council members questioned the school system's choice to build a new school, Subin remained firm in his support. In the end, Weast was forced to drop the building project for a compromise plan. It was a rare defeat for the superintendent. "Subin's sway over the council seemed to fade in the days after the Seven Locks controversy. As part of its 2007 budget plan, the council voted to hire two analysts to focus exclusively on the school system's budget." For a self-promoter like our school superintendent, Jerry Weast is becoming more and more shy with Washington Post reporters, even though the Post editorial board is still in love with him. Thankfully the Post's news reporters are of a different breed than their editors. The reporters have been digging facts that have the superintendent on the defensive. 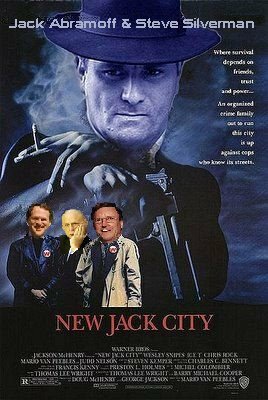 As JerryWeast.com reported on August 13, the superintendent was strangely unavailable for comment when the Post called about his involvement in a shady deal to privatize Montgomery County Public School (MCPS) property to a private school connected with convicted felon Jack Abramoff. Now, he's keeping his distance from another Post reporter who wanted his take on how he lost his main political patrons in the County Executive post and on the County Council. "Weast declined to comment" on the loss of County Council Education Committee Chairman Michael Subin, according to the Post, but a spokesman sent the reporter an e-mail that heaped praise on the defeated legislator. Weast declined to comment about the outcome of the election but through a spokesman offered e-mail comments praising Subin for his work. "Mr. Subin and Jerry Weast have too tight of a relationship," a prominent Montgomery County special education advocate tells the Washington Post. "I think a lot of things were done behind closed doors," Bob Astrove says. "The school system had gotten to the point where it really didn't have to answer fiscal questions of the council largely because Subin has been there so long." School Board member Steve Abrams, commenting on how the September primary elections suddenly stripped Superintendent Jerry Weast of his main allies, says that Weast's critics are motivated by jealousy. "Abrams said criticism of Subin's leadership and his relationship with Weast may have stemmed from bruised egos more than anything else," the Washington Post reports today. "It was institutional friction," Abrams tells Post correspondent Lori Aratani. "There may have been some jealousy because Jerry Weast is a player. Jerry's a very forceful personality, and when you combine a forceful personality in a school superintendent and county executive who were both on the same page when it came to education, well, some members of the council felt left out and tried to be more assertive." Here's a character development and school safety story for you: MCPS is allowing thugs indicted for armed robbery to play for other county public schools. Whitman High School wouldn't let the three troublemaking students return to school this fall. But MCPS said they could go attend other public schools - and represent them in sports. The decision is a "disgrace," Potomac resident Barry P. Smith writes in the Almanac. Though the athletes must be treated as innocent until proven guilty, the facts presented by county prosecutors show that the county school system has a responsibility to protect the other kids. Furthermore, one of the athletes admits he did the crime but says in his own defense that the gun was a replica that couldn't fire. Whitman Principal Alan Goodwin tried to expel the student, but couldn't. Four of the five Wheaton students involved in the crime have been sent to other Montgomery County Public Schools; one now plays football for Rockville. Smith argues, "responsible public officials are paid every day to make decisions based on the 'best available information.' According to its own Web site, 'MCPS is committed to providing a safe and secure learning environment for students and staff. Safety and security of our schools is everyone's concern.'" "It is hard to imagine that MCPS educators will ever get a better opportunity to establish the minimum standards of conduct for their students," says Smith. "One of the stated missions of the MCPS athletic program 'is to teach and reinforce values in student-athletes as they relate to wholesome competition, good sportsmanship and fair play.' Allowing students who are under indictments for serious offenses to compete is hardly a way to reinforce 'wholesome competition.'" "Several MCPS staff who have been involved in handling this incident have turned in subpar performances (the list is growing) and many people in the community have taken notice." "Allowing the students to attend other schools while the judicial proceedings continue would appear to be reasonable action as long as the legitimate safety and security concerns of the staff and parents of those schools can be heard and addressed," in Smith's words. "But the MCPS decision to allow them to play football at their new schools is outrageous and unacceptable." MCPS is hiding behind the argument that it has no written rule about whether or not indicted armed robbers should be allowed to play football for county high schools. William Beattie, the MCPS director of athletics, "publicly stated there is no specific rule that would deal with a student arrest and any decision that would bar the students has to come from the local high school," Barry P. Smith writes in the Almanac. "For instance," says Smith, "grades, alcohol-related violations and even attendance problems trigger automatic penalties for athletes. I am certain these 'contracts' do not specify every criminal offense that a student athlete could be sanctioned for. If other issues can be taken into account . 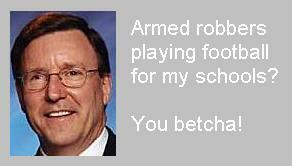 . . what should be done for armed robbery? "Parents and other citizens should not be expected to sit back and watch MCPS officials reassign student athletes who are under indictment and then have MCPS declare they have no standing on whether they should continue to be allowed to participate in athletic and other extracurricular activities. . . .
"Allowing players to compete on our athletic fields wearing GPS ankle bracelets is bringing national scorn to Montgomery County. The most troubling thing is . . . we deserve it. . . ."
"MCPS’s handling of this matter has been, and continues to be, a total disgrace. Pushing responsibility 'downstream' to the local high schools shows a complete lack of leadership and a dangerous disregard for the needs of the entire community," Potomac parent Barry Smith continues in the Almanac. "Without exception, every single parent I have discussed this issue with feels MCPS has failed in its handling of this situation. "Minimizing the students’ actions and allowing them to 'play on' at other schools so they can get recruited, should not be a consideration. Educators are supposed to set standards and then hold their students accountable for their actions. MCPS is apparently content to wait for prosecutors and judges to sort out who should be allowed to participate in MCPS extracurricular activities." The judge presiding over the case of a former Whitman High School football player indicted for armed robbery says that the student's alleged crime is so serious that he must be tried as an adult. "My take on the seriousness of the offense and your role in it weighs very heavily against you going to juvenile court. Good people do not do this. 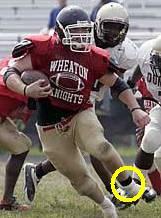 This is not 'boys will be boys,'" Judge Joseph A. Dugan, Jr., told the student, now a star player for Wheaton High School. MCPS punishes wayward students for far less serious offenses, but ruled that the alleged armed robber, who has a previous criminal conviction, should be allowed to play. According to the Washington Post, Judge Dugan says the crime is grave, telling the student, "you're involved in a robbery with a dangerous weapon." A Wheaton High School football coach sums up the county school system's view of sportsmanship. Referring to the football skills of a 17 year-old convict now being tried for armed robbery, first-year coach Tommy Neal tells the Washington Post, "I'd be a fool to take him off the field." According to the Washington Post, the robber playing for Wheaton "said his ankle monitor is light enough that he hardly notices it when he plays, and it will not encumber him. Even though Maryland high school players are not allowed to wear jewelry on the field, Lazear will be able to play with the monitor. 'The umpire will inspect it before the game and make sure it is adequately padded,' said Ned Sparks, executive director of the Maryland Public Secondary Schools Athletic Association." Voters in the September 12 primary elections picked candidates favored by the Save Seven Locks Coalition and other responsibility-in-education voters. County Executive candidate Ike Leggett wins the Democratic primary (and by implication, the November election) with a staggering 61 percent of the vote. Leggett created the county Inspector General 's office and supports strengthening it. County Council at-large candidates George Leventhal, Marc Elrich and Duchy Trachtenberg, the top three vote-getters among Democrats to compete in the November election. District 1 County Council incumbent Howard Denis, a Republican who enjoys substantial bipartisan support, ran unopposed in the primary. District 5 County Council candidate Valerie Ervin, a staunch ally as a member of the Board of Education, wins the primary with 62 percent. Board of Education at-large candidate Shirley Brandeman, also favored by Seven Locks boosters, wins the primary with 59 percent of the vote. District 5 Board of Education incumbent Nancy Navarro wins a solid 57 percent of the non-partisan vote. She's a Democrat, but she enjoyed a lot of Republican support. County Councilman Michael Subin is the only incumbent politician in Montgomery County to be thrown out of office in the September 12 primary. His Democratic party turned its back on him. Subin, who chaired the council's Education Committee for 20 years, finished in a humiliating fifth place in the at-large county council race, receiving 12 percent of the vote. He took the term "bully pulpit" seriously, using it to demean and destroy critics of Superintendent Jerry Weast, and to intimidate PTA members and parents of schoolchildren from speaking out against alleged corruption, abuse of power, and other wrongdoing in the Montgomery County Public Schools system. The potty-mouthed Subin will be remembered as the council's "Dr. 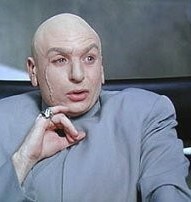 Evil," the Austin Powers bad guy to whom Seven Locks kids said he bore a strong resemblance. Subin was often parodied at the school and on this blog. Montgomery County primary election tally: Opponents of public accountability of education lose, while proponents win. Democrat party candidates who opposed the Inspector General investigation of the Seven Locks/Kendale scandal are the big losers. County Councilman Steve Silverman, candidate for County Executive, and Councilman Mike Subin, running for re-election, both aggressively opposed the IG probe and sought to limit public accountability. Voters dumped them. Democratic voters overwhelmingly repudiated Silverman. For all the money he spent, they gave him a measly 36 percent of the vote, versus 61 percent for Isiah Leggett. Republican school board member Steve Abrams, another big opponent of the IG, was rejected as the party candidate to become comptroller ofthe State of Maryland, WUSA-TV reports. He's likely to stay on as school board member, though, as his term doesn't expire this year. JerryWeast.com will certainly be there to continue skewering him. Did the Save Seven Locks Coalition play a role in these electoral victories? The Seven Locks Elementary School voting station was one of the most heavily attended in the county, where turnout overall was considered light. Race-baiting against critics by failed County Executive candidate Steve Silverman, departing County Executive Doug Duncan, and defeated County Council member Michael Subin backfired. 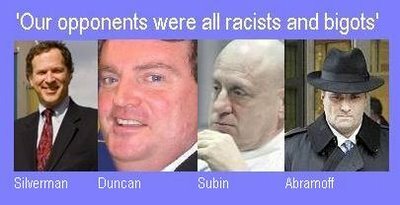 They had alternately accused critics of their controversial school privatization schemes - handing over public school property to convicted lobbyist Jack Abramoff and plotting to turn Seven Locks Elementary School to developers - of being motivated by racism and anti-Semitism. 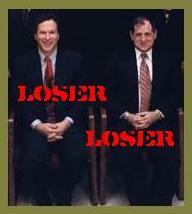 Their tactics failed in the September 12 primary election. Washington Post columnist Marc Fisher reported a while back what Silverman had been saying privately - that racism and bigotry motivated the Seven Locks community's opposition to having their school torn down and replaced with high-density housing. The Seven Locks bigots voted overwhelmingly for Isiah Leggett over Silverman in the primary election, for school board champion Valerie Ervin to the County Council's District 5 seat, and the only other hero on the school board, Nancy Navarro, to her District 5 seat. Fisher noted in his September 14 piece, "In one contest after another, blacks and whites alike convincingly trashed politicians' cynical belief that voters can be counted on to cast ballots along racial lines." More Orwell-speak from the people who run our school system: Jerry Weast kept his word and done away with the hundreds of temporary classrooms that parents, teachers, and MCPS officials have always called "portables." The "portables" are no more. MCPS has re-named them. We are now to call them "learning cottages." The Almanac reports that the new "learning cottages" at the cramped and overflowing Bells Mill Elementary School are a bit leaky. Superintendent Weast says that learning cottages less than 11 years old need no replacement. But according to the Almanac, portables made and installed less than a decade ago were full of mildew and rot. Janis Sartucci, former Churchill Cluster PTA coordinator, took pictures of the mildewed portables as they were dismantled at Bells Mill over the summer. "I saw rotting wood on portables less than 10 years old," she told the Almanac. "If you talk to manufacturers . . . [portables] are not meant to be around ten years, and they need constant maintenance. The school system’s policy has been to put them down and leave them. They should be inspecting them every year, but there’s no money in the budget to go and repair these structures." Will Montgomery vote for crony government? In an editorial fawning over our magical superintendent, the Washington Post takes cheap shots at the Board of Education’s only Hispanic member, accusing her of condoning "illegal" activity and saying she’s not in the best interests of the children. Worse than Nancy Navarro's "unnecessary style of confrontational politics" and her support an "illegal plan to import prescription drugs from Canada," according to the Post, is her insufficient support for Superintendent Jerry Weast. After listing Navarro’s traits that disturb Post editors, the paper concludes, "Mostly, though, we are disturbed by what we see as her tepid support of Mr. Weast, whose contract comes up for renewal next year." Without endorsing any candidate, the Post suggested that either of Navarro’s white opponents in the District 5 primary would be a better choice. 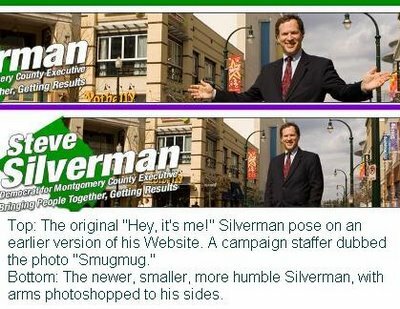 His own campaign staff calls him "Smugmug," so it was no surprise that County Councilman Steve Silverman had his image photoshopped to a less egotistical pose on his Website. Not long ago, Silverman's county executive campaign Website featured the candidate standing in the middle of the street, arms stretched wide as if to say, "Hey, it's me, everybody!" Campaign staff labeled the image "Smugmug." 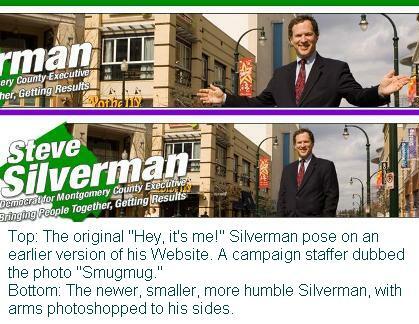 More recently, Silverman's site was redesigned, with a smaller image of the candidate in the same pose, but with his arms apparently photoshopped to his sides. Silverman was a prime mover behind the discredited stealth effort to tear down Seven Locks Elementary School, turn it into a big development project, and corral the kids into a new mega-school that the PTA overwhelmingly opposed. He is also tied to convicted felon Jack Abramoff's deal to turn public school property into a private school at taxpayer expense. 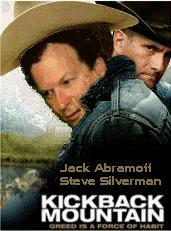 On July 6, JerryWeast.com parodied the Silverman site, featuring the Smugmug picture with the caption, "Don't audit my special projects. Trust me." The meanest member of the County Council says he laments the lack of civility in local politics. "Civility isn’t something that this council seems to treasure," Councilman Michael Subin tells the Almanac in a candidate profile. "I think the Seven Locks issue was a perfect example – there was a total lack of civility all around." During the Seven Locks controversy, Subin browbeat a constituent who raised concerns about official wrongdoing, used foul language in front of children at a public hearing, threatened to abuse his power to retaliate against the Seven Locks community for demanding a probe of official corruption, and even threatened to punch out a Seven Locks dad - right in the presence of the man's second-grade son. Seven Locks Elementary School kids know the skin-headed Subin as a movie character named "Dr. Evil." Subin is running as a Democrat for re-election to the County Council. He has chaired the council's education committee for 20 years. Dancing to "moolah-moolah" can-can music, animated caricatures of county councilmembers sing about how they brought sprawl, congestion and overcrowded "learning shack" classrooms to Montgomery County. 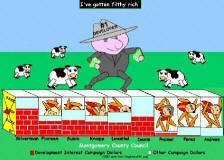 The animated cartoon appears on NeighborsPAC.org, the homepage of Neighbors for a Better Montgomery. The group includes PTA members who are concerned with how the county has made life difficult for public school children. Those skewered in the cartoon are Council Members Steve Silverman, Nancy Floreen, Michael Subin, Michael Knapp and George Leventhal. To view the cartoon, go to www.NeighborsPAC.org and click on the "County Council Can-Can" image. 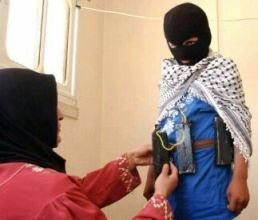 Moms - don't dress your kid in a suicide belt for school. Some MCPS schools are making first graders sign a document that they won't bring bombs or firearms to school, or make bomb threats or do any number of terrible things. Parents must countersign. Glad to know that MCPS is doing its part for homeland security.